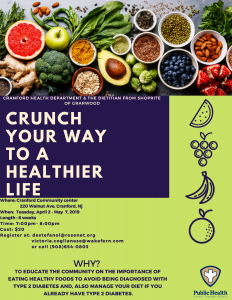 Cranford Health Department in collaboration with the ShopRite Dietician brings Cranford residents a 3- Series Workshop on Health! 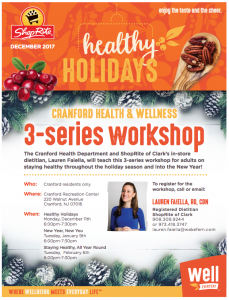 This workshop focuses on staying healthy throughout the holiday season and into the New Year! To Register for any of the workshops call 908.309.9244. or email [email protected]. 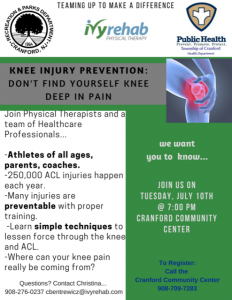 For questions please reach out to Cranford Health Educator, Lindsay Prewitt, CHES at 973.418.3747. Faiella is holding a workshop for Cranford residents on maintaining your healthy lifestyle goal! February 6th, 2018 at 6:00pm-7: 30 pm where wellbeing meets everyday life! 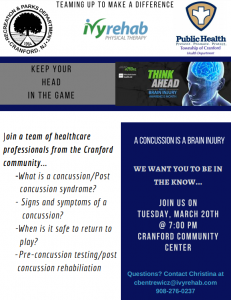 Join a team of healthcare professionals from the Cranford community… -What is a concussion/Post-concussion syndrome? – Signs and symptoms of a concussion? -When is it safe to return to play? Are you a new mom? Do you know a friend who has a new baby and could benefit from this information? Join Ivy Rehab and the Cranford Health Department at the Cranford Recreation Center on May 17th, at 11:00. 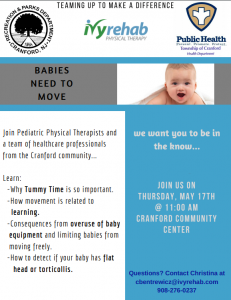 You will hear from a pediatric physical therapist and walk away knowing the importance of tummy time, how movement is related to learning, consequences from overuse of baby equipment and limiting babies from moving freely, and lastly hot to detect if your baby has a flat head or torticollis. To attend the program you must register ahead of time. Please do so by calling the number 908-276-0237 or emailing [email protected]. Free Testicular, prostate, and colorectal examinations. Yearly check-ups are recommended for all men starting at 40-50 years old. 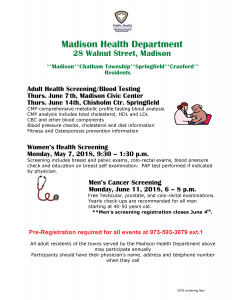 **Men’s screening registration closes June 4th.